We are now one month away from opening the doors to the big show and we have some very exciting news to share with you! 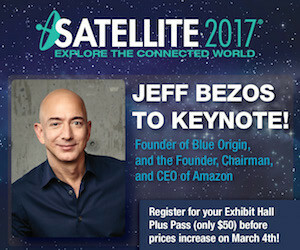 Jeff Bezos, founder of Blue Origin and founder and CEO of Amazon, will be our special guest keynote speaker at SATELLITE 2017 and will kick off our Tuesday morning opening general session program at 8:15 a.m., followed by our big Global Satellite Operator CEO panel at 9:00 a.m. I will be conducting a fireside chat-style interview with Jeff during his appearance to discuss new developments in launch technologies that lower costs and increase access to space. There are many ways to attend SATELLITE. Can't attend the full conference? We have one day passes and single sessions available for purchase! Already registered for the Exhibit Hall Plus pass? Upgrade by accessing your registration below! U.S. Air Force Maj. Gen. David D. Thompson, Vice Commander of Air Force Space Command will be our SATELLITE 2017 Government & Military Keynote Speaker, appearing on Wednesday, March 8 at 1:45 p.m. in room 207. General Thompson assists in organizing, training, equipping, and maintaining mission-ready space and cyberspace forces and providing missile warning, positioning, navigation and timing, communications and cyber capabilities for North American Aerospace Defense Command, U.S. Strategic Command and the other functional and geographic combatant commands. General Thompson also directs and coordinates the activities of the headquarters staff. The SATELLITE 2017 Government & Military Forum runs Monday, March 6 through Wednesday, March 8 and is produced in partnership with the Satellite Industry Association (SIA) and Defense Daily. Last chance to feature your presentation in the SATELLITE Unveiled Theater! Five presentation slots in the SATELLITE Unveiled Theater at SATELLITE 2017 are currently available. This is your last opportunity to have a dedicated presentation built directly into the conference program, led by the speakers and presenters of your choice! With much of the technical and engineering-focused content moving to the SATELLITE Unveiled Theater for the 2017 event, inclusion of your presentation in the overall program will be completely seamless to attendees. You can present on any topic you want during the available 30-minute time slot of your choice, but if you want pre-show promotion of your presentation, we need to hear from you now. Contact Michael Cassinelli today at +1 (301) 354-1691 or mcassinelli@accessintel.com to reserve one of the last five remaining slots while they’re still available! Monday, March 6 | 5:00-7:00 p.m.
Help us kick off SATELLITE 2017 at the Welcome Reception! Get a glimpse of our local attractions at this D.C. themed reception. Enjoy drinks, hors d'oeuvres and plenty of networking with fellow attendees of SATELLITE 2017. Open to all SATELLITE registrants. Petah Tikva, Israel, January 17, 2017 -- Gilat Satellite Networks Ltd. (NASDAQ, TASE: GILT), a worldwide leader in satellite networking technology, solutions and services, announced today a strategic partnership with Air Esurfing, a fully owned subsidiary of Air Media Group, to transform the domestic IFC market in China. The partners intend to utilize China’s Ka-band HTS capacity for domestic IFC services over mainland China.